"Unchained from fate, the Norse gods Loki and Hel are ready to unleash Ragnarok, a.k.a. the Apocalypse, upon the earth. They’ve made allies on the darker side of many pantheons, and there’s a globe-spanning battle brewing that ancient Druid Atticus O’Sullivan will be hard-pressed to survive, much less win. And Atticus recruits the aid of a tyromancer, an Indian witch, and a trickster god in hopes that they’ll give him just enough leverage to both save Gaia and see another sunrise. There is a hound named Oberon who deserves a snack, after all." I'm quite willing to thank all the gods I can think of, fictional and otherwise, that this is the end of the series and that it was such a short book. This is a dissapointing, thoroughly unsatisfying and anti-climatic end to the series. 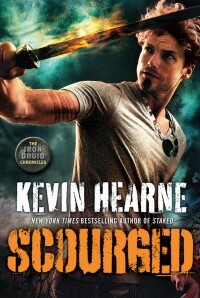 The Iron Druid Chronicles started off really well, then started going sour somewhere in the middle. This conclusion is a short novel that starts off slowly and where nothing much happens, except Ragnarok - which wasn't as well written as any of the previous battles and was also pretty mediocre with no suspense (i.e. dull and booooring!!) and no feeling of risk. The events covered in the book entirely lack impact and danger. This is supposed to be the end of the world, but feels like a bar-room brawl instead. At no point did it feel like the Druids had a chance of loosing. In the previous books I cared about the characters, in this book - nothing. It was just bland. None of the POV characters have any kind of in-depth communication within the book - if you hadn't read the previous books you would think these three people had never met! This is the Iron Druid Chronicles, but for some reason Atticus seems to get less page time? There are a few subplots (if you can call them that) but they don't add to the main story and are rather pointless filler. The ending is also completely ridiculous, inappropriate and out of proportion. I can't give details without adding spoilers, but that was definately a WTF!!! moment. This book also lacked the humour and "magic" that made the rest of the series fun to read. There was also a great deal of unnecessary foul language in this installment. This book feels like an unedited outline of a first draft. I get the impression Hearne was bored with the series and couldn't be bothered to write a decent ending, so went for the whole lot of caracturised chopping up people but no decent plot with shocker ending just to get rid of the book.